At one point in this new Japanese documentary about the Fukushima Daiichi power plant disaster, the camera focuses on a sign above a town turned to rubble. Loosely translated, the sign says, "Atomic energy makes our town prosperous." One can't help but recall another sign, "Arbeit Macht Frei," hovering above the site of another human tragedy. The mocking words in each case point up the horror beyond. But in the case of Fukushima the tragedy involves a conundrum of culpability, and the reaction to the immediate disaster has been strangely muffled. "Nuclear Nation" means to make some noise, but is only partially successful. If you were looking for a documentary to blow the lid off the secrecy around the extent of the destruction, and lack of restitution—in other words outrage à la Michael Moore—you will not find it here, but there is much that is worthy and troubling. What you will find is a young filmmaker, Atsushi Funahashi, who uses his camera as silent witness to what, up to now, has not been fully seen and acknowledged. Here's what we already knew: On March 11, 2011, a devastating earthquake and tsunami hit Japan causing a hydrogen explosion at the number 1 reactor at Fukushima Daiichi nuclear power station; radiation was released. The town of Futaba, 3 kilometers from the explosion, was ordered to evacuate immediately and those who fled had no time to take anything—not clothes, not food, not pets or livestock. Eventually, two more reactors would be crippled. The earthquake and tsunami left 20,000 dead or missing in northeastern Japan. The filmmakers started shooting within three weeks of the disaster to show us what we didn't know. The movie opens quietly—with the sound of wind and a shot of reactors in the hazy distance, then a close-up on cherry blossoms catching the breeze on a spring day. We later learn that the wind blew radiation in the direction of those fleeing ground zero. We also learn that the Japanese government failed to report the level of radiation and those residents were contaminated. Fourteen hundred of Futaba's inhabitants fled to an abandoned high school 250 kilometers away, and a year later, 500 still live there on the floor, in classrooms, eating rice gruel, trying to pass the time, mourning their dead relatives and friends, and feeling betrayed by a government and a corporation (The Tokyo Electric Power Company, TEPCO) that has not apologized to them individually or told them what will become of their town or if they might ever go home. Home is now a landscape leveled; people cloaked in masks and protective garb have been gradually allowed back briefly to gather belongings from splintered homes. But it's the sight of the rotted, mummified corpses of livestock, left behind to die a slow death from starvation, that sickened me most, and that tacitly carries the film's message: the inhabitants who worked the plants have been left behind in the dark, not knowing what's to become of them. The film is most effective when the camera stands steadily by these refugees, the lens in close on their faces, to capture long-held emotion making its way to the surface. We meet a man and his son still agonized over the loss of the mother, "a sweet woman," who was swept away, still in her home, by the tsunami. The sight of the son holding back tears is painful, but even more disturbing is watching him come to the realization that but for the power plants, his mother would be alive. And this is the undercurrent that is never fully explored, what at some level everyone connected with the film—filmmaker and villagers alike—are dealing with. 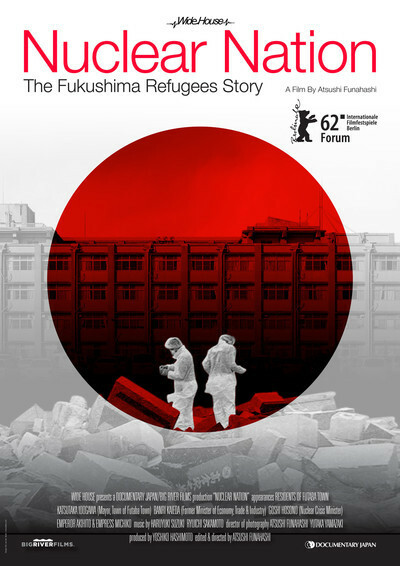 The filmmaker himself is from Tokyo, and understands that these nuclear plants were deliberately built far from the places where the power was used, becoming the main industry in small villages where people were promised jobs and money—in exchange for all the risk. This is eventually conveyed by the mayor of Futaba, Katsutaka Idogawa. His town enjoyed the short-term benefits of the nuclear power business for 40 years, but now he says that he sees it was the people in Tokyo who prospered while "we were swimming in radiation." His face reveals a troubling awareness of his role—perhaps unwittingly—in that Faustian bargain. Unfortunately, "Nuclear Nation" is slow going, and given the uniqueness of the documentation and the importance of its message, it deserves to be more compelling than it is. The film doesn't always make clear how much time has passed or where exactly we are. Too often the video meanders or the action stops so a fact can be trotted out, clumsily, as words on a black background with all the sound dropped out. Had this material been more pointedly and dramatically organized, and had the filmmaker been more willing to examine the cruel ironies of the issues raised in a country shadowed by Hiroshima and Nagasaki, "Nuclear Nation" would have landed more powerfully in a world that is becoming harder to see through the haze.